December—the month of finals and holiday mayhem. The days are growing shorter while your to-do list grows longer. With final projects, finals to study for, and holiday gifts to buy, it seemed natural to hold our December SEPTAdventure at a coffee shop to prepare ourselves for the day ahead. This month, we traveled to Cake and the Beanstalk which is located at 1112 Locust Street. 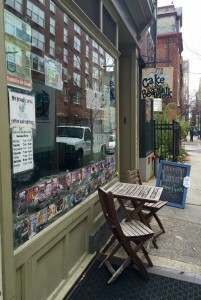 Cake and the Beanstalk is only a few blocks from Thomas Jefferson University and is really accessible from anywhere in Philly using SEPTA. Mike and I came from Germantown using the Manayunk/Norrristown regional rail line. We got on at East Falls Station at 9:06am and rode, bleary-eyed, to Jefferson Station. It was only about a 10 minute walk from Jefferson Station, which turned out to be much shorter on the way back thanks to the caffeine clearing out my head and making it possible to follow directions again. Dré took the 27 bus from Manayunk and Penndale to 15th Street, then jumped on the Market-Frankford Line toward Frankford Transportation Center and got off at the 11th Street station. From there it was only a 7 minute walk. Jon, coming from Drexel, got on at 30th Street Station and rode to Jefferson Station. Once he got to Jefferson, he walked to 12th and Market and caught the 45 Bus, which dropped him off at 12th and Locust, just a few hundred feet away from Cake and the Beanstalk. Once everyone had arrived, it was time for breakfast! Right as you walk in the door of Cake and the Beanstalk, you are confronted with a display of beautiful pastries. The smell of coffee brewing fills your nose as you gaze at the chalkboard menu. Cake and the Beanstalk offers coffee, breakfast, smoothies, ice cream, pastries (including vegan choices), and, of course, cake. I decided on a slice of the quiche of the day, made in-house from scratch, and a large café au lait. Dré ordered a piece of raspberry crumble and a hot chocolate. 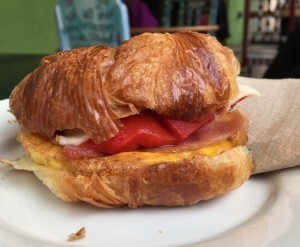 Mike ordered a breakfast sandwich with ham, egg, cheese, and red peppers on a croissant, a café au lait, and the two of us split a piece of blueberry crumble. Jon, a vegan, ordered a slice of vegan banana bread, a black coffee, and a banana. We walked into the dining area of the café to find a table. Three of the walls in this room are entire spans of windows. The sole concrete wall is painted a bright green, displaying a collection of artwork for sale. There are tables of all shapes and sizes scattered around the room. The most amusing part about the room are the chairs. Each chair has its own theme, and each one is covered in artwork. Each of us had to get up at one point or another to look at the painting on our chair. Two of the walls of windows face out into a garden, and there is actually a patio with chairs outside for you to enjoy your coffee on during the warmer months. The garden, though a little less fruitful due to the season, was huge and green. There were a few vegetables still holding on in the garden, and it was so nice to enjoy our meal while looking out on actual dirt and plants. The food was brought out to us, and the table fell silent as we stuffed our faces and sipped our hot beverages. It was incredibly difficult to get everyone to wait until after I took a picture for them to eat their food. Jon had his entire piece of banana bread scarfed down before I could get the camera ready. 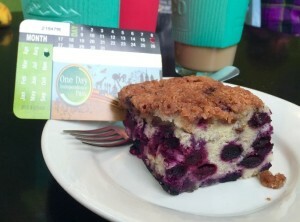 Let me just say that both the food and the coffee at Cake and the Beanstalk rocks. 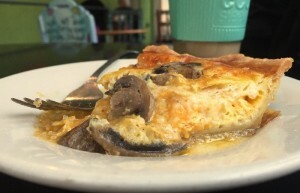 The quiche was warm and cheesy on the inside, and buttery and flaky on the outside. The cake was so sweet and moist. 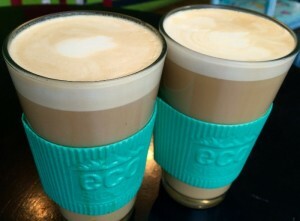 The coffee was seriously amazing. The balance of coffee to milk was perfect—it was thick and frothy while allowing the flavor of the coffee to shine through. Plus, it came in a pint glass, which I now believe is the proper quantity and method to serve coffee. I can tell you that my other adventurers were very satisfied with their meals. No scraps were left and all glasses were empty. We stayed at Cake and the Beanstalk for another hour catching up and conversing. 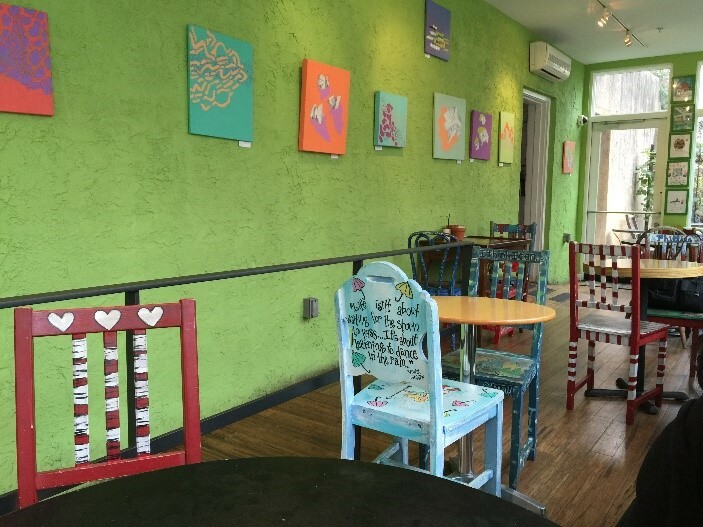 The setting is so inviting—it makes you want to spend your whole day there talking, drinking coffee, and eating, which is totally doable if you bring your SEPTA independence, weekly, or monthly pass and use pass perks!